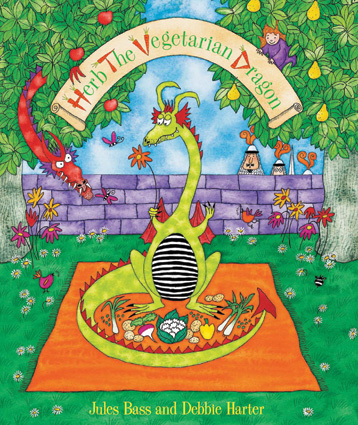 Herb the Vegetarian Dragon is a tale of dragons and knights, meat eaters and vegetarians, and one brave child. Herb spends his days quietly gardening in the company of a small girl. The king, tired of the meat eating dragons (led by Meathook) gobbling up villagers, instructs his knights to capture all of the dragons they can and bring them to the village for beheading. Meathook and the others wait out the hunt in hiding. Herb, who is not friends with the other dragons, is captured while gardening. Meathook pays Herb a visit in prison, telling him he will save him if he eats meat, but principled Herb refuses. The beheading is imminent when the little girl speaks up, informing the executioner and crowd that Herb isn’t a meat eater. Herb is released while sneaky Meathook is caught. The king tells the dragons that they must work out a plan to stop eating people, and Meathook and minions agree to stop eating villagers. Herb offers to teach them gardening. The dichotomy of this book is that it contains casual messages of death while at the same time relying heavily on the vegetarians-as-pacifists stereotype. Though this book is intended for kindergardeners to third graders, my son enjoyed this tale most as a two and three year old, and consequently we did a lot of editing as we were reading to make it more appropriate for him. This book is a mixed bag. The vegetarian protagonist comes across as a social outcast for most of the story. The general tenor of the book is pleasantly silly if one gets around the pillaging dragons, the dragon hunt and the near-beheading of the sympathetic main character. The vivid illustrations, the brave girl speaking truth to power, Herb’s yummy garden and cooperative problem solving are the highlights of the story. There is also a message throughout of not forcing one’s eating habits on others, no matter what they may be. One of those spooky coinicdences- literally just read this to my boys aged 5 and 7. They love it, it was a gift a couple of years ago from my Vegan sister. I am a veggie myself, both my boys do eat meat though, yet still get that it’s “mummy’s choice” to not do so. This book does indeed illustrate that too, and we enjoy reading it together. It’s not one of the Barefoot Books Green Baby stocks, however, we are tremendous fans of this brilliant publisher. That’s so adorable. I’ll definitely show this to my kids. My (veggie) children loved this book when they were little.